It is important for you to know the different angioplasty risks you can face, as this is the case with all medical procedures that involve invasive intervention. Angioplasty helps in restoring the blood flow to certain parts of the body, and this process involves the surgical correction of defects like narrowing or blockages in the arteries with the use of stents (wire meshes) and balloons. It should be noted that the benefits of the angioplasty procedure outweigh the risks and complications. If you have been advised coronary (heart) angioplasty, here are a few risks that you would be susceptible to. Angioplasty risks are often indicated by chest pain and swelling in the site of catheter insertion. Allergic Reaction: You may face an allergic reaction to the radiographic dye (also known as radio-contrast dye), which is used for visualising the blood vessels during an angioplasty. The symptoms of an allergy are itching, restlessness, apprehension, sweating, an increase in body temperature, and a rapid pulse rate. Blood Vessel Damage: This might be caused when the blood vessels are penetrated with the catheter. Bleeding at the place where the catheter is inserted is also common. Arrhythmia: Due to the procedure, you might face an irregularity in your heartbeat, also called arrhythmia. Chest Pain: This is a risk that you might face if the balloon blocks the blood vessel and cuts the supply of blood to the heart. 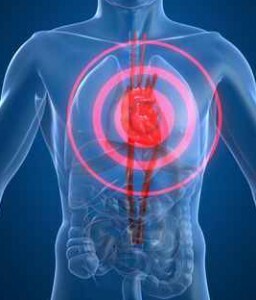 Heart Attack: This happens in 3-5 % of the cases, and it may occur due to the abrupt closure of the coronary artery. This stops the supply of blood and oxygen to the heart. The death rate in such cases is very low (around 0.1 %), and emergency surgery during the procedure is required in less than 3% of subjects, if a mishap occurs. Kidney Damage: The radiographic dye that’s injected into the blood may damage the kidneys. Patients of prolonged kidney diseases especially face this risk. Stroke: This occurs in less than 1% of the cases. 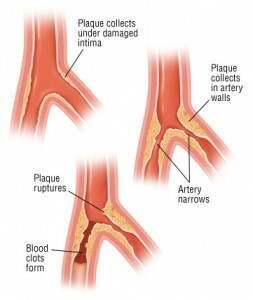 Blood clots might form in the blood vessel due to the stent (a wire mesh used to repair the vessel), and these may move to the brain, causing a stroke. Re-stenosis, a condition under which the artery gets blocked again due to the development of excessive tissues, is a complication caused by stents. This excessive tissue growth occludes the lumen and reduces the blood flow, and it might take weeks or even months to occur. Re-stenosis has been reported in around 15% of the cases, when stents are used. It should be noted that 30% of the patients develop re-stenosis even without the stents. Patients also face a risk due to exposure to radiation. The use of X-rays for visualising the blood vessels during an angioplasty may cause these side effects. To counter this, doctors only use acceptable levels of X-rays. Are You Prone To Angioplasty Risks? How Can You Identify Angioplasty Risks? It is easy to protect yourself from angioplasty risks once you know what to expect, and follow the instructions of your doctor. Post surgery care is equally important for successful angioplasty recovery. An angiogram or angiography is a medical imaging technique through which blood vessels in the body are visualized, mainly to check for any blocks, narrowing, dilatations and structural anomalies. This procedure is used to detect the need for angioplasty, a procedure through which narrow and hardened arteries are corrected. This is a diagnostic test that’s done after a patient exhibits atherosclerosis symptoms. What Does The Angiogram Procedure Involve? Through an angiogram, arteries, veins, and the four chambers of the heart are visualized by injecting radio-opaque dye (which is recognized by X-rays) into the body. Coronary (heart) angiogram, cerebral (brain) angiogram, and renal (kidneys) angiogram are the different forms of angiograms, based on the area of vasculature to be visualized. Where Is An Angiogram Procedure Performed? 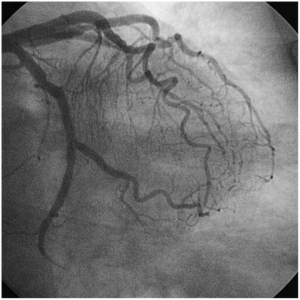 An angiogram is a minimally invasive technique, and it is usually performed in a cardiac catheterization laboratory by interventional radiologists or cardiologists. Medications (to continue, stop, or modify the dose). More importantly, ask them for advice on aspirin and heparin. Blood tests (kidney function tests, blood clotting, and bleeding time). You will need to fast for at least 8 hours before the angiogram procedure begins. The doctors might run a prior test with the dye to make sure that you’re not allergic to it. During an angiogram procedure, a radio-opaque dye is injected into the body. What Happens During The Angiogram Procedure? You will be taken to a coronary catheterization laboratory for the angiography procedure, and in order to maintain healthy circulation, the doctor will put you on intravenous fluid infusion. Your doctor will decide the site for inserting the catheter. Depending on the area that needs to be visualised, the doctor will choose the right blood vessel. In more than 95% cardiac catheterizations, veins of the femoral region (groin and upper thigh) are used. The femoral artery (artery in groin-upper thigh region) is used for left heart catheterization, while the femoral vein is used for right heart catheterization. To avoid the risk of infection, the skin over the site of insertion is shaved and cleaned before the doctor punctures the artery/vein with a large bore needle. A catheter is passed and pushed through the needle till the desired site is reached. An X-ray machine is usually set to visualise the dye in the blood vessels, and these visualizations are projected on a video screen. The dye is then injected at the chosen site, and rapid shots of X-rays are captured as the dye flows through the blood vessel. This way, any narrowing, blocks, or malformations in the blood vessels are highlighted with ease. 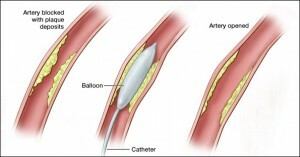 The angiogram procedure takes around 30 minutes, and after the procedure is over, the catheter is taken out and the puncture site is pressed for 10-15 minutes to prevent bleeding. Patients are monitored for about 6 hours and may even be advised bed rest for 2-4 hours, till their vitals become stable. Are There Any Risks Associated With Angiograms? Can An Angiogram Help Determine The Need For An Angioplasty? The angioplasty procedure is a surgical procedure that helps restore the lumen of blocked/ narrowed blood vessels, and an angiogram helps in revealing the sites and extent of blockage or narrowing in the arteries. Once a patient presents with some of the atherosclerosis symptoms, doctors take the call and recommend the angiogram procedure. Once the condition has been diagnosed, further treatment measures are chosen.